Our new still is here! Exciting news! Our new still arrived from the factory. Renovations to accommodate this new beauty are nearly completed. It should be fully functional in February. The kettle is 1,000 liters – double our current capacity, and this still can achieve a much higher alcohol content in the first pass. The higher the alcohol content, the lower the residual flavors from the mash. This results in a much more neutral flavor in the distilled spirits. We then add distilled water to lower the alcohol content to the desired level. 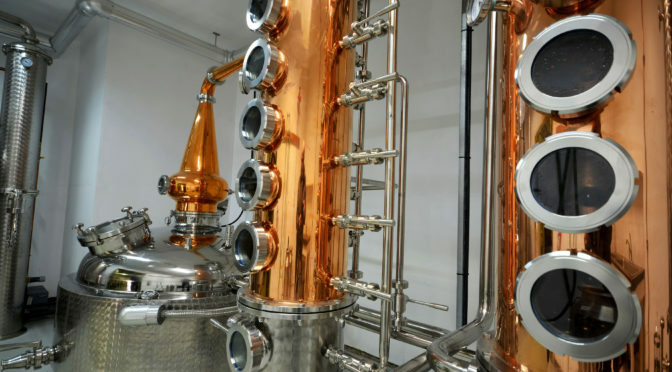 Flavors such as the botanicals for our gin are then re-introduced. The end result will be a very clean, neutral flavored spirit. And we’ll be able to greatly increase our capacity. So, drink up — there’s more to come!